There’s more to New Caledonia than glitzy resorts and fancy French restaurants. During an adventure to the mountainous north, Samantha Kodila discovers an enduring indigenous culture, defiant in the face of change. Our four-wheel drive bounces along a pot-holed road, leaving a cloud of dust in our wake. Palm trees, stained soft pink, resemble floating fossils etched into the sky, and curlicues of smoke weave through the air in the dying light. We abandon the road and cross a skinny bridge before our vehicle is swallowed by a tangle of trees. As we head deeper into the wilderness, my guide, Nellye, tells me about Bernard, and I realise this man is far more than just my host: he has played a pivotal role in Kanak history. I’m suddenly overcome with nerves. To visit an indigenous tribe, guests must perform a customary gesture, starting with a formal introduction and sharing a few words about themselves. They can then request to stay with the tribe by making an offering of a manou, a piece of coloured cloth, as a sign of good faith. I meet Bernard in the soft yellow light of his patio. He is an elderly man, not much taller than me. His brown eyes are so dark they’re almost black, and their whites seem to glow. His skin is smooth and weathered, and I imagine he’s spent many years in the sun. 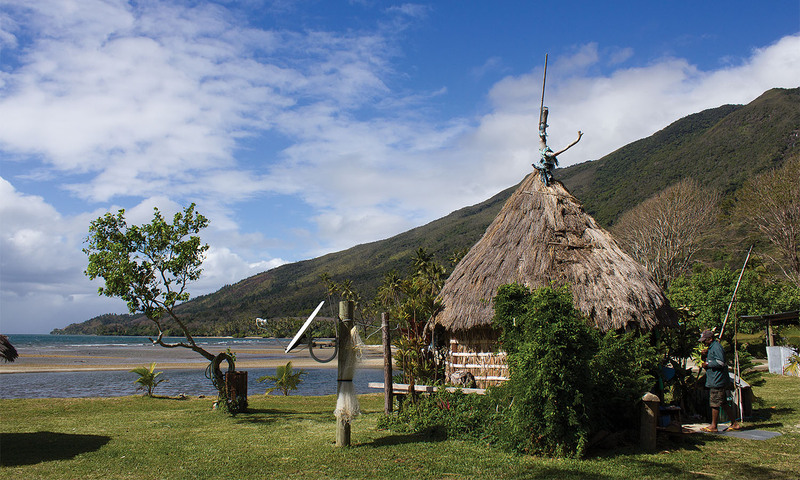 A traditional hut, fully equipped with a satellite dish, on the beaches of Poeubo on New Caledonia’s northeast coast. My French is negligible at best and, in my nervousness, I completely forget my lines. The words “bonjour, merci, thank you for having me” tumble from my mouth, and I hastily lay the cloth on the table between us. I wait, eyes wide, barely remembering to breathe. He contemplates me for a moment, then begins speaking in French, gesturing to the cloth, to the land and to me. Bernard talks for a long time. I’m desperately hoping my short speech hasn’t offended him. Finally, he stops. A soft smile spreads across his face and he extends his hand, grasping mine in a firm handshake. I’m in New Caledonia’s Northern Province and have arrived at the Kanak tribal village of Tiendanite, about six hours’ drive from the country’s capital, Nouméa. You won’t find any skyscrapers or yacht-infested marinas in the north. On the road out of the capital, swanky homes and neat manicured lawns give way to rugged fields and endless mountain vistas. Crossing from west to east, we strike a verdant coastline of cascading waterfalls and beachside campsites, fringed by the ocean. Rustic stalls filled with soapstone carvings and fresh fruit and vegetables line the winding roads, and friendly waves make us feel at home. But much of the local community is shrouded in wilderness. Sometimes the only signs of life are the flash of a bright tin roof, the glow of a campfire, or a letterbox made from a hollowed-out television. When we arrive at Tiendanite all my preconceived notions of a tribe – traditional body paint, ancient songs and dancing around campfires under the stars – suddenly feel contrived. Bernard – the first Kanak in New Caledonia to host foreigners – welcomes me into his tribe on behalf of his people and their spiritual ancestors, a ritual he has been performing for more than two decades. From savannahs to tropical rainforests, New Caledonia’s mountain chain is a natural paradise. A little girl and her grandfather accept a delivery of baguettes from the side of the road. We sit down to dinner – a feast of potatoes, noodles, rice, salad, fresh fish and chicken – and Bernard tells me his story and the history of his people. The Kanaks are the Melanesian indigenous inhabitants of New Caledonia, which has been under French colonial rule since 1853. Forced into segregation and enslavement, the Kanaks were locked in a long and sometimes bloody fight for independence (the struggle continues today), and Bernard has the battle scars to prove it. He was one of seven Kanaks injured (another 10 were killed) in an ambush by pro-France supporters in 1984. 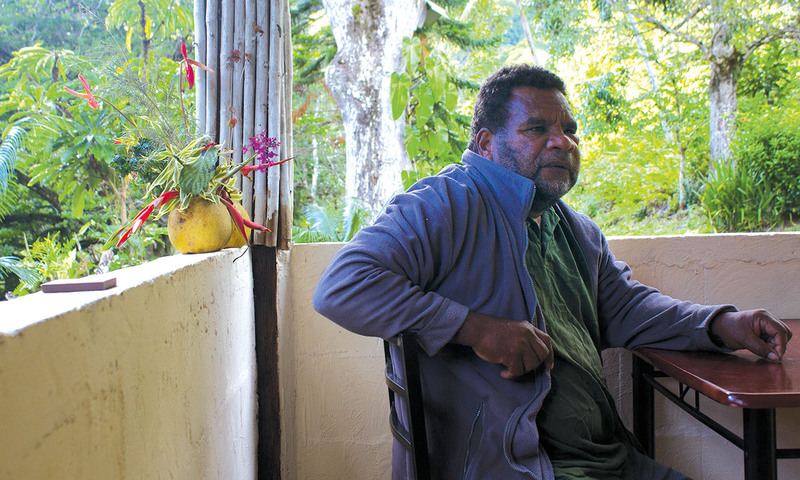 Recuperating in Nouméa for two years, Bernard resolved to tackle his oppressors differently: rather than fight, he would welcome them into his tribe and educate them about Kanak culture. He began discussions with his clan’s chief, who in turn deferred to the grand chef (big chief). The process would take nearly five years, and there would be more casualties along the way, including that of the leader of the Kanak independence movement, Jean-Marie Tjibaou, who was assassinated by extremists within his own ranks and is buried in Tiendanite. Bernard now hosts foreign guests, mostly from France, up to 15 times a year. When I ask how he communicates with English-speaking travellers like myself, he says (through Nellye) that he speaks with his hands, raising them aloft as if to say, What can you do? After a moment, Bernard asks me why more Australians don’t come to New Caledonia. It’s a hard question to answer. After all, the island is only a three-hour flight from Sydney. But I sense this is more than just a question: there’s a longing in his voice, a desire to know people from places unknown, to share a connection. After a dessert of the biggest, juiciest pamplemousse (grapefruit) I’ve ever seen, we bid each other goodnight and Bernard shakes my hand once more, still smiling. The morning brings a misty rain. What was shrouded in darkness the night before is now awash with colour in the early light, and I find myself surrounded by towering forest. Cabins and huts dot the hills, interspersed with coconut palms, bushes straining with yellow pamplemousse and bursts of hot-pink bougainvillea and yellow allamanda flowers. We drive to the village of Ouanache, about half an hour from the bayside town of Hienghène, where I will embark on a two-day trek through the mountains to the tribal village of Tiwae, then to Pombei. It’s dry season, but rain is again falling. Nellye leaves me with Jehudit Pwija, a well-known and respected guide. His smile is warm and his enthusiasm, in spite of the weather, is infectious. I realise just how capable a guide he is when, a few minutes into our journey, he stops, motionless, and sniffs the air. “A deer died here,” he says quietly. “How do you know?” I whisper, awed. “I can smell it,” he says matter-of-factly, without taking his eyes off a point in the distance. It’s a serious moment that belies Jehudit’s fun, cheeky nature. Later he pulls out a machete from a deerskin sheath strapped to his side. The blade looks worn and tarnished but, at nearly a metre long, has me wary. My expression must betray my thoughts and a sly smile cracks Jehudit’s face. Brandishing the knife in front of him, he whispers, “This is my little knife,” then falls about giggling and proceeds to use it to dig a carrot-like vegetable out of the ground. I quickly learn not to take anything he says too seriously. One of many beautiful beachside lunch spots along the northeast coast. As the trail steepens, the hike becomes punishing. The sun escapes from behind a cloud and I feel my skin sizzle angrily. We pass a young Kanak man with bare feet and a machete hanging loosely in his hand. Soon we reach the top of a mountain and the views of the surrounding ranges make the sweat and sunburn worthwhile. The environment is an integral part of the Kanak’s existence. Jehudit shows me how to bind bunches of long grass and peel away the thick, flaky skin of niaouli trees to build a traditional hut. He teaches me how to recognise flowering banana plants, the cacti-like leaves of ananas (pineapple) and leafy taro growing wild in the forest, and explains hunting methods used for catching deer, pigs and freshwater prawns. We examine ancient petroglyphs carved into mounds of stone, and clusters of 10-metre-high bamboo. We dig into the soil for vegetables and crush niaouli leaves, inhaling their refreshing, mint-like scent, and scour the landscape for black notou pigeons, wild pigs and deer. The blade looks worn and tarnished but, at nearly a metre long, has me wary. On the weekends workers return from the mines, showing off their new gadgets. It’s not unusual to walk into a traditional hut and find a flat-screen TV, Playstation or wireless internet. It causes unrest within the tribes. Despite being a sharing community, money earned isn’t always money shared, and this shift from the collective to the individual is creating a disconnect from tradition. In some instances, those who must stay back to look after the land miss out, and there is great temptation to leave and create their own fortune. This new-found desire for money also has an environmental toll and, on the drive back to Nouméa, Nellye and I will see gaping terracotta wounds across the mountains where nickel has been mined. In a land of such biodiversity (more than 80 per cent of New Caledonia’s flora is endemic) it is a sad sight to behold. By late afternoon I’ve guzzled all my water and my pack is chafing against my sunburn, so it’s a relief when we arrive in Tiwae. A group of young girls crowded around a smartphone waves to us then returns to their screen. As I shuffle past traditional huts and a large church, I again feel a twinge of nerves. I’m red-faced and slick with sweat – this is not exactly how I want to meet my host. Suzanne, a petite elderly woman dressed beautifully in a blue headscarf and flowing green dress, doesn’t seem to notice my dishevelled appearance and greets me with a big, warm smile in her bamboo-framed common room. The room is small with a pebble floor, and a large wooden table laden with refreshments fills the little space. Soft floral curtains flap against the window and brightly coloured baskets woven from coconut leaves hang from the ceiling. My customary gesture is better this time – I find myself telling Suzanne about myself, my journey through New Caledonia, and how much I look forward to learning more about her culture. She, like Bernard, doesn’t speak English, but she nods, as though she can sense my genuine interest, acknowledging my offering as I lay the manou on the table between us. Now that I have been welcomed into Suzanne’s tribe, she considers me family and will care for me like one of her own during my stay. I’m honoured and humbled. Dinner is a spread of purple yams, pumpkin, rice, fresh fish and deer. After the day’s trekking I’m ravenous, but the sight of deer meat (earlier in the day we stumbled across the beast’s head spiked on a branch) has put me off that particular protein. I tuck in to everything else with gusto, knowing the food is guaranteed to be free of artificial nasties. Bernard relaxing out on his patio. The conversation turns to Kanak culture, and I gesture to the woven hanging baskets. Suzanne smiles a little sadly and tells me young girls are more interested in Facebook than crafting baskets these days. It seems a lot has changed since her days as a child. Traditions that were once an intrinsic part of life, such as marriage customs and newborn rituals, are practised less often or not at all. Nellye and I retire to our traditional hut, made from long grass and niaouli, just like Jehudit had shown me. It’s easily large enough for 10 people, and the colourful floor mats and high ceiling remind me of a circus tent. There’s no heating, no bathroom and, as I soon realise upon visiting the shower – a tin shed with a cobwebbed Western toilet and a rusty pipe hanging over a concrete slab – no hot water. Shivering, I sink into my mattress. My mind drifts to Suzanne and I wonder what it must be like to have lived a life of tradition and ritual, only to watch it slowly slip from the lives of your children and your grandchildren as modern technology infiltrates and slowly erodes your culture. I wake up in the soft glow of the early hours, warm like a caterpillar in its chrysalis, and fumble around for my alarm, only to realise it’s the crowing of a rooster in a nearby field. Aircalin flies direct to Nouméa from Sydney, Melbourne and Brisbane. You can stay in tribal villages for about US$35 per person, per night, including breakfast and dinner. A list of accommodation can be found on New Caledonia’s official tourism website. When you’re ready to head back to civilisation and a hot shower, the bungalows perched over Hienghène River at Ka Waboana Lodge (from US$114) and the beautiful beachfront villas at Tieti Hotel in Poindimié (from US$229) are a perfect way to wind down. In Nouméa the hotel Le Lagon has rooms from US$153 a night. For those not fluent in French, an English-speaking guide is a must. Tour companies Arc en Ciel and Toutazimut offer treks through the mountains, four-wheel-drive tours and tribal village visits.